Decide how much to bet per payline, then pick 1 to 50 paylines you want to bet on. You can adjust your bet amounts by pressing the plus and minus symbols. The minimum coin value starts at £0.01 and up to 5. You can bet 1 to 10 coins per spin. Spin by clicking the Pyramid. If you don’t want to fidget and want to maximise your chance for big wins, just click Max to select all paylines at the current bet level. There is also a good selection of autoplay options in case you just want to just relax let your bets ride. If so, sit back and enjoy your trek through time and space to ancient Egypt and the Valley of the Kings. Akhet symbol (a golden-horned reflecting pool) is the Wild, substituting for all other symbols except Bonus and Scatter. The Bonus is a structure featuring two golden columns, triggering a side game. The Scarab beetle is the Scatter. 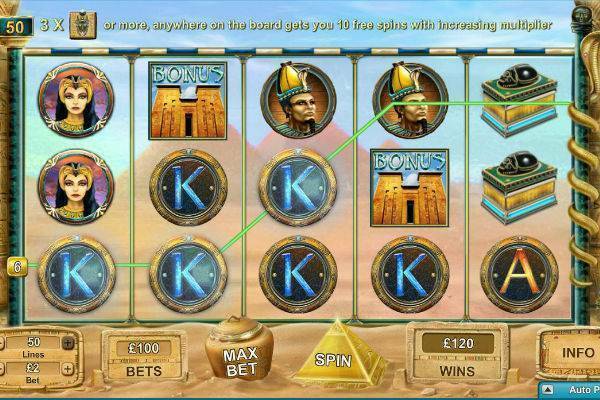 3 or more scarabs trigger free spins, and 5 scarabs in a row will also pay out a handsome 200x bet. When a scarab hits, it gains colorful flapping wings It’s not a bug, it’s a feature! Lower paying symbols include an Ankh, the Eye of Horus, an Ace and a King. All symbols are intricately and beautifully designed, creating a delightful, almost hypnotic effect when you spin. The fixed jackpot in the Mighty Sphinx is won when you spin 5 of the Wild symbols (the reflecting pool), and consists of 4,000 coins. We know this doesn’t sound like much, but when you hit it with a bonus round it’ll be doubled. The next biggest prize is 4 of the Wilds, which would land you 1,000 coins. Other symbols pay significantly less, so keep your fingers crossed for the Wild! Free Spins: Three or more scarab beetle Scatters anywhere on the reels triggers 10 free spins, with a multiplier increasing with each spin. Bonus Game and Double Bonus Game: The special Bonus symbol of a golden two-column structure – when it appears in any of the middle three reels, it will trigger a bonus round: The Tomb of Treasures. If a special symbol shows on a winning pay line, you’re in luck. If lady luck is really smiling on you, hitting them twice will give you a Double Bonus, where all prizes are multiplied by two. The bonus round, unfortunately, cannot be triggered in free spins. This bonus game has different levels, each offering a chance to win an ever-increasing prize. Enter the tomb and uncover stones to find the cash prizes underneath. Advance upward. Even if you lose your lives, you still can accumulate money, with the sum won at any moment appearing up on the left side of the pyramid. The goal is to reach the apex of the pyramid to win the grand prize. Even if you “strike out”, you can win a cash sum which grows each successive time! The Mighty Sphinx is a beautiful, aesthetic game to play. The golden and sand-coloured frame contains the 5 slickly designed reels, set against a backdrop of the great pyramids. The background sounds are atmospheric, with cries and tweets of birds and mournful horns. You feel immersed in an ancient and exotic culture. Wins are celebrated by animations and sound effects. 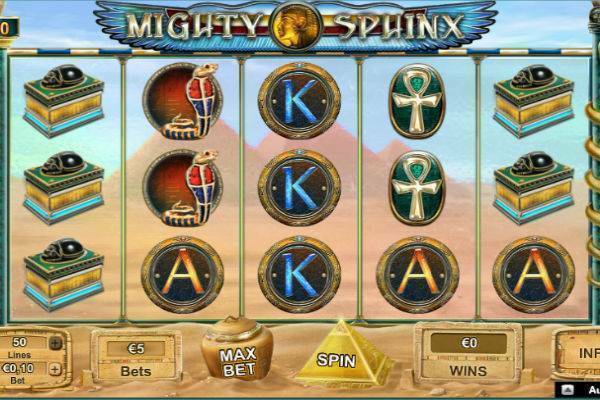 The Mighty Sphinx from Neogames is a solid, brilliantly designed, video slot with a well-executed ancient Egyptian theme. It is easy on the eyes, and easy to play. Best of all, the bonus game has different levels with increasing prizes that will keep your adrenaline running. Go discover this Egyptian treasure at one of our recommended slot sites!